Gary Trotter began working with youth sports as early as his college days at Bradley University, when he coached boys' basketball at St. Marks grade school in the late`5Os. He continued by next working with freshman baseball at Peoria High School. 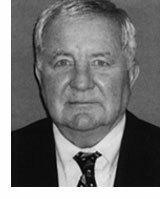 Upon graduation in 1958, he entered the service and in 1960 he began working at Pleasant Hill grade school where he taught and coached the boys' sports. He holds great pride in the fact that he was able to coach a state championship basketball team during his stay at Pleasant Hill. Each summer he worked with the Park District little league at Bradley Park. He enjoyed his stay with the little league, having coached many local athletes. One of the more notable players would be Jim Thome. Gary feels very blessed to have coached Jim and his two brothers. Jim even called him to let him know when he went to the `Big Leagues." Spending 25 years or more with little league players was a joy. There were many tournament and city championship games played. After leaving Pleasant Hill grade school in 1974, Gary went to East Peoria High School. There he began coaching golf, basketball, and baseball. Even after retiring in 1993, Gary went on to coach until around 2000. After retiring in 1993, Gary began to teach golf classes at ICC. He continues to enjoy these classes and looks forward to the next. He presently is volunteering at the YMCA and working with youth basketball. Sports and young people continue to be an enjoyment. This University of Indiana senior out of Peoria High School led the Hoosiers to an NCAA appearance. Their leading season scorer with a 19.7 pga, and 4th leading career scorer, A. J. Guyton was heavily honored along the way. Guyton gained All-American, All-Big Ten and Big Ten Conference co-Player of the Year for his stellar season. Then the real fun began.